Sometimes the most slap-dash of posts get the most attention and my recent post, Atheism, Cults and Toxicity, is the latest instance. 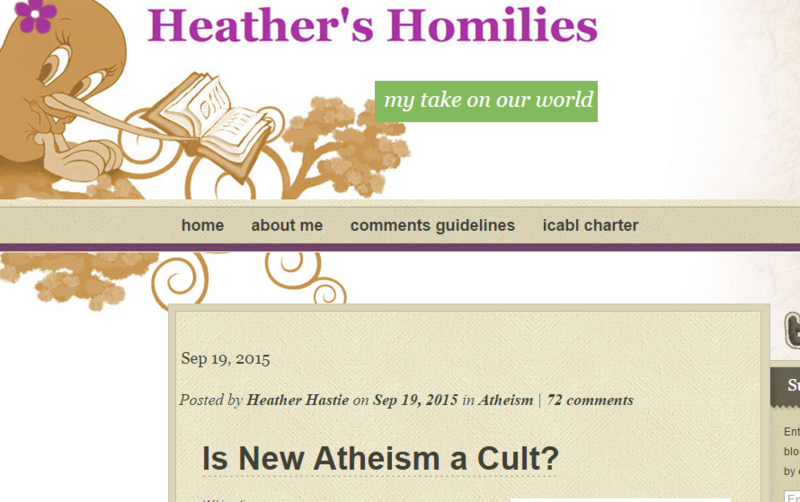 At this moment it has garnered 111 comments and today Heather Hastie of Heather’s Homilies has responded to it with Is New Atheism a Cult? with another 72 responses at this moment. — anyway, as I was saying, I only read the first few pages of this work by an author (named C.J. Werleman) and was immediately struck by how “true” it rang with my own personal experience of exchanges with fervent supporters of Coyne’s, Harris’s and Dawkins’s views on the role of the Islamic religion in Islamic extremism today. It also struck a chord with my very similar experiences with some of the less scholarly advocates of the Christ Myth theory. So I posted a few chunks of Werleman’s early pages that I believed hit the nail on the head in their description of the toxic tone of these Harris-Coyne-Dawkins and Murdock supporters with respect to the specific question of Islam and religion as forces of evil today. Before I continue let me say that yes, I do agree that Islam’s teachings are socially retrograde in many respects but I also recall how it is only in recent years that Christianity itself and some Indigenous belief systems have begun to struggle out of many medieval and prehistoric values that have brought misery and even death in their wake; I oppose toxic and oppressive religions as anyone who has read anything about my past knows; and I do fully support any and all constructive programs aimed at encouraging liberalization with humanistic values in all faiths. Jerry, what concerns me about the various statements made by yourself along with Dawkins and Harris is that they are not informed by specialist scholarship — sociologists, anthropologists, political scientists et al — in Islamic and terrorist studies. Rather, they seem to be fueled by visceral reactions without the benefit of broader understanding and knowledge that comes from scholarly investigations into these phenomena. It almost appears to some of us that your criticisms are willfully ignorant of the scholarship. I find these visceral responses coming from trained scientists difficult to understand.